The majority of pilot-caused aircraft accidents occur during the takeoff and landing phase of flight. Because of this fact, the pilot must be familiar with all the variables that influence the takeoff and landing performance of an aircraft and must strive for exacting, professional procedures of operation during these phases of flight. The takeoff or landing speed is generally a function of the stall speed or minimum flying speed. The rate of acceleration/deceleration during the takeoff or landing roll. The speed (acceleration and deceleration) experienced by any object varies directly with the imbalance of force and inversely with the mass of the object. An airplane on the runway moving at 75 knots has four times the energy it has traveling at 37 knots. Thus, an airplane requires four times as much distance to stop as required at half the speed. The takeoff or landing roll distance is a function of both acceleration/deceleration and speed. Runway surfaces vary widely from one airport to another. The runway surface encountered may be concrete, asphalt, gravel, dirt, or grass. The runway surface for a specific airport is noted in the Chart Supplement U.S. (formerly Airport/Facility Directory). Any surface that is not hard and smooth increases the ground roll during takeoff. This is due to the inability of the tires to roll smoothly along the runway. Tires can sink into soft, grassy, or muddy runways. Potholes or other ruts in the pavement can be the cause of poor tire movement along the runway. Obstructions such as mud, snow, or standing water reduce the airplane’s acceleration down the runway. Although muddy and wet surface conditions can reduce friction between the runway and the tires, they can also act as obstructions and reduce the landing distance. [Figure 11-16] Braking effectiveness is another consideration when dealing with various runway types. The condition of the surface affects the braking ability of the aircraft. The amount of power that is applied to the brakes without skidding the tires is referred to as braking effectiveness. Ensure that runways are adequate in length for takeoff acceleration and landing deceleration when less than ideal surface conditions are being reported. Water on the runways reduces the friction between the tires and the ground and can reduce braking effectiveness. The ability to brake can be completely lost when the tires are hydroplaning because a layer of water separates the tires from the runway surface. This is also true of braking effectiveness when runways are covered in ice. When the runway is wet, the pilot may be confronted with dynamic hydroplaning. Dynamic hydroplaning is a condition in which the aircraft tires ride on a thin sheet of water rather than on the runway’s surface. Because hydroplaning wheels are not touching the runway, braking and directional control are almost nil. To help minimize dynamic hydroplaning, some runways are grooved to help drain off water; most runways are not. Tire pressure is a factor in dynamic hydroplaning. 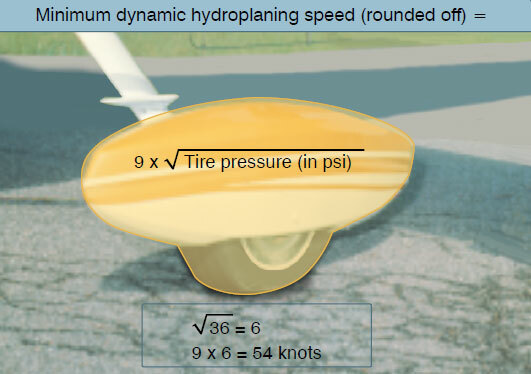 Using the simple formula in Figure 11-18, a pilot can calculate the minimum speed, in knots, at which hydroplaning begins. In plain language, the minimum hydroplaning speed is determined by multiplying the square root of the main gear tire pressure in psi by nine. For example, if the main gear tire pressure is at 36 psi, the aircraft would begin hydroplaning at 54 knots. Landing at higher than recommended touchdown speeds exposes the aircraft to a greater potential for hydroplaning. And once hydroplaning starts, it can continue well below the minimum initial hydroplaning speed. On wet runways, directional control can be maximized by landing into the wind. Abrupt control inputs should be avoided. When the runway is wet, anticipate braking problems well before landing and be prepared for hydroplaning. Opt for a suitable runway most aligned with the wind. Mechanical braking may be ineffective, so aerodynamic braking should be used to its fullest advantage.